Created in collaboration with programmer Brad Bouse, Between Page and Screen is a book of poems that contains no text, only stark black-and-white geometric shapes and a web address leading to betweenpageandscreen.com, where the reader follows instructions to display the book on his or her webcam. Our software detects the square markers in the book and projects poems mapped to the surface of the page. Because the animations move with the book, they appear to inhabit “real” three-dimensional space—a kind of digital pop-up book. The poems—a series of cryptic letters between P and S, two lovers struggling to define the bounds of their relationship, do not exist on either page or screen, but in the augmented space between them opened up by the reader. 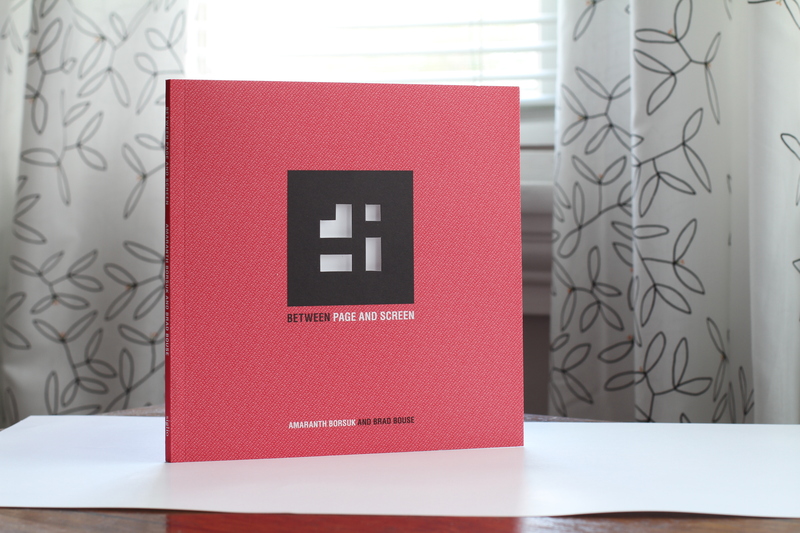 Originally created as a limited-edition hand-made artist’s book, Between Page and Screen was published in 2012 by Siglio Press and went through two printings. A second edition is now available from SpringGun Press. Readers interested in book arts and book history can print and bind their own copy and create their own augmented reality poems using our DIY tools. For more information, visit www.betweenpageandscreen.com. CU Boulder Creative Writing Series, reading and talk (2016). E-Lit under the stars, University of Southern California, Tapin2 (2013). ELO, Modern Language Association Conference, off-site reading (2013). Poetry off the Page, Arizona Poetry Center (May 2012). Elizabeth Cooperman. “Notable Books.” Poetry Northwest (February 2014). Jessica Pressman. “Reading (Between) Machine.” American Book Review (January 2014). Abraham Avnisan. “Between Page and Screen.” Rain Taxi Review of Books (October 2012). Ander Monson. “Mirror Work.” American Letters and Commentary 23, Special Issue: The Future of the Book (August 2012). Peter Szatmary.”Between Page and Screen” Phi Kappa Phi Forum (Fall 2012). “A Useful Pageant,” Anna Lena Phillips, American Scientist 100:3 (May-June 2012). “Seen/Scene, Sheet, and Screen: Reading Amaranth Borsuk and Brad Bouse’s Between Page and Screen,” Timothy David Orme, Diagram 12.2 (May 2012). 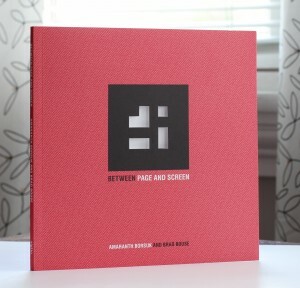 “May Book List: Between Page and Screen,” Hey, Small Press!, May 8, 2012. Maria Popova.”Between Page and Screen: A Digital Pop-up Book About Love.” Brain Pickings, April 30, 2012. Cassia / Muse of What. “Coolest Book Ever.” April 19, 2012. Daniel Donahoo.”Why I Love Augmented Reality Right Now,” Geek Dad, Wired, March 27, 2012.